One of South Florida’s most powerful Blues and Rock guitarists.
. . . Midnite Johnny has worked extensively throughout his native USA and has established a reputation as one of South Florida’s most powerful Blues and Rock guitarists. 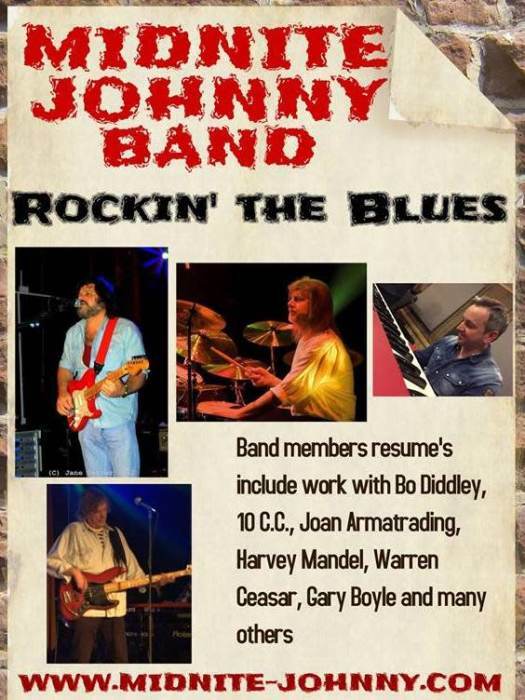 A lead/slide guitarist and vocalist specialising in Blues, Blues Rock, Classic Rock, and R & B, Guitar style reminiscent of Eric Clapton, Carlos Santana, Freddie King and Buddy Guy. One of South Florida’s hottest musicians whose resume includes work with Bo Diddley, Harvey Mandel (Canned Heat),Warren Ceaser and many more. This veteran of the South Florida Blues scene employs a library of riffs from Freddy King to Otis Rush and Eric Clapton to Stevie Ray Vaughn along with his own original material. Since relocating to the UK Midnite Johnny has fast built a dedicated following throughout Europe. With his band they offer a wide ranging and varied array of Blues, R&B and Roots Rock. The bands vast influences and experiences take them to a place where "The Roots Of Blues Meet The Hard Edge Of Classic Rock & Roll".